« Green Gadgets: the person-powered lawnmower. If you’re interested in making leafy greens an enjoyable part of your diet, I highly recommend Paula Wolfert’s book Mediterranean Grains and Greens. My favorite greens recipe, however, does not come from that book but from another of her books, Paul Wolfert’s World of Food. She calls it “marmalade of spring greens,” and it is intended as a spread for bread. I find it wonderful stuff to have tucked in the refrigerator, where it will keep for several days and makes great impromptu lunches and snacks. I have made it so often for so long that my recipe has morphed into something a little different from hers, as tends to happen with recipes that really work for me. First, catch your greens. See my earlier blog post about greens options and about cleaning them. Right now I am mostly using mixtures of amaranth leaves ( the polite term for common pigweed), lambs quarters, purslane, sweet potato leaves, and New Zealand spinach, because those are the plants that are doing best in our summer heat. Gather about a pound of assorted greens. If you are using store bought, a mixture of Swiss chard or Tuscan kale and spinach will work well. I avoid the baby spinach that comes in cello bags. It doesn’t have enough flavor for use as a cooked green. If you enjoy bitter greens you can add several dandelion leaves (I am referring to the store bought kind, not the wild kind, which are too bitter to use at this time of year.) Or you can add a small bunch of watercress to add a little bit of snap. But don’t worry too much about this, because the seasonings will add the extra kick as long as the greens are good. Bring a pot of water to a boil, add the greens, and cook uncovered for one minute, just until they are thoroughly wilted. Drain and press out any excess moisture. Turn them out on the chopping board and chop them thoroughly in both directions, so that you retain some texture (you don’t want a paste) but all stems and leaf ribs are cut up into small pieces. Chop the garlic and shallot quite finely over medium heat in the olive oil until cooked through but not brown. Add the chopped olives and the capers, either chopped or whole as you prefer. Sauté for a few minutes, then add the chopped greens, the red pepper, and a little salt. Cook over low heat, stirring occasionally, for about 15 minutes or until the greens are tender. Taste, season with salt and pepper as needed, and spread thickly on toasted or grilled bread. 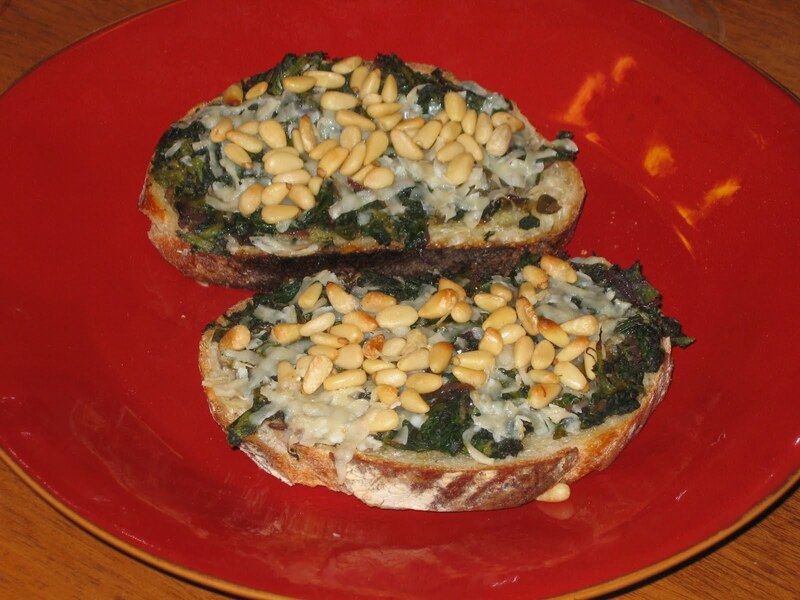 Top with some grated Parmesan cheese and a handful of toasted pine nuts. Many variations are possible, and I seldom make this dish the same way twice. I may add several cloves of confited garlic instead of two cloves of fresh for a deep mellow flavor. A mashed filet of anchovy or a dash of colatura added at the saute’ stage give an especially rich flavor- this is very close to the Wolfert original. A generous spoonful of roasted tomato sauce added toward the beginning is a nice touch. A half teaspoon of Spanish smoked paprika, Pimenton de la Vera, gives a faint smoky edge as if you had cooked it over a wood fire. A good sprinkling of fresh thyme or chopped oregano or marjoram leaves over the top just before serving gives a lovely whiff of its Mediterranean origin. A poached or fried egg plopped on top makes it a hearty meal. You can serve the greens at room temp on a bed of fresh ricotta, drizzled with your best olive oil, and serve the bread on the side. I should add that, like so many other things, it seems to taste best if cooked in clay. 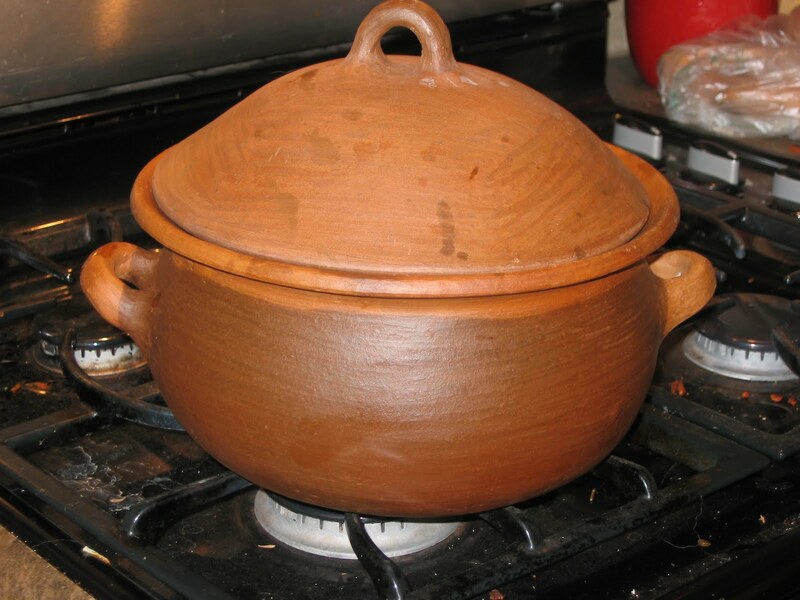 I tend to use either an unglazed clay bean pot or a Spanish cazuela, after doing the initial blanching of the greens in an ordinary pot. A Chinese sand pot works well too. If you’re curious, do read another of Ms. Wolfert’s books, Clay Pot Cookery, which contains everything you might want to know about cooking with clay. As soon as I saw the picture my mind was full of the possibilities. It would be good on a pizza crust or bread shell, too. Do you ever chop your greens before you cook them? To me it seems a bit tidier than chopping cooked greens. I’m just getting into growing greens so I wasn’t ready to transition into summer greens. I was so glad to learn about sweet potato leaves and they are growing well in my yard farm. What an impressive plant, so much food from the space they take. I have them growing over the sides of the beds as well as up trellis, so I can pick plenty growing in the walk ways. Your blog inspires me. Thanks for the kind words. Chopping greens before cooking works fine. I do it afterwards because the volume reduces dramatically when blanched, making the chopping a quick one or two minutes instead of a more prolonged effort. Probably the nettles got me in the blanch-first habit, too, because it makes them painless to handle, which is certainly not the case when they’re raw. But use whatever works. The important thing is to eat plenty of them. Nettles! That was the first post of yours that I saw. I wonder if they can be planted in the fall for spring? I wish I had gotten them in my back ally strip in time to greet the taggers that spray painted my building! I’m hungry to try them. BTW, have you ever frozen greens, if you have too many? If so, there’s a good blog idea for you. Yours is such a fun blog! Keep it up! Feel free to visit mine if you have the time!